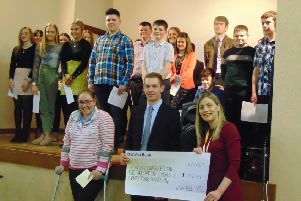 On Friday, June 15th 2018 Rathfriland Young Farmers Club hosted their annual treasure hunt and barbecue. Attendees completed a 45 minute route kindly composed by Mark Elliot around Rathfriland and the surrounding area gathering clues and answers to questions. Afterwards they were welcomed back to the club hall for a steak and burger barbecue. The evening was sponsored by G A Allen, Glascar, Co Down and was well supported with over 20 cars attending the event. A donation of the proceeds went to Southern Area Hospice Services.